The first slab in Nottingham's new look Market Square was laid on Saturday. The slab was lifted by a special machine and manoeuvered into position by New Zealand singer Hayley Westenra. The paving as a type of granite called Crystal Azul chosen for its durability, high-quality finish and aesthetic suitability for its surroundings. Nottingham City Council said the square's £7m makeover, including a new water feature, should be complete by mid-November. 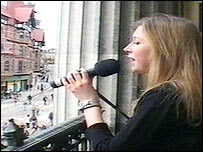 After laying the slab, 18-year-old Hayley Westenra, who was due to perform at Nottingham Arena on Saturday evening, entertained the crowds with a rendition of "amazing Grace" from the Council House balcony. The new design will include pit foundations for future Christmas trees. The square will be closed to the public for a year while the work is completed. Credits: Article located by George (forum member) who attended the Nottingham concert.